Sam Nabi/Some rights reserved under the Creative Commons license. Boasting several sweeping viewpoints and hilly areas, the city of lights is not lacking where sweeping and dramatic views are concerned. Providing skies are relatively clear, here's where to head for the most breathtaking panoramic perspectives of Paris. Make sure to bring along a good camera, and maybe a map to assist you in identifying important monuments and sites on the skyline. Pictured here: In this dusky view from popular rooftop bar Le Perchoir, you can glean the Sacré Coeur Basilica towering over the city in distant Montmartre (see next slide). The panoramic viewpoint at the base of the Sacre Coeur Basilica in hilly Montmartre is a favorite. You can either brave the stairs up to the top, or take the funicular up the hill for the price of a metro ticket. Do watch your belongings here, though, as pickpockets are known to operate in the area. To get there, take Metro line 2 to Anvers, and follow signs to "Butte Montmartre" (Montmartre Knoll). From the top deck of the world-famous Eiffel Tower, you can see most of the city's famed landmarks-- not to mention enjoy watching the crowds below swarm around like tiny ants. If you don't suffer from vertigo, walking part or all of the way up to the top levels can be a true adventure- but again, it's not for the faint of heart. One of Paris' only skyscrapers, the Montparnasse Tower has, in this writer's humble opinion, little charm aside from the breathtaking panorama provided by a ride to the top. Visit the tower before exploring one of the city's more modern neighborhoods, where 20th century writers like Henry Miller were known to haunt nearby bars and cafes. See Paris as the Emperor Napoleon apparently wished to: from a sweeping vantage atop the 164-foot tall Arc de Triomphe, a monument scaled to the ego of the leader that commissioned it. From here you can witness the perfect symmetry of the Avenue des Champs-Elysees, the Tuileries Gardens beyond, and the entire line of monuments known as the "Trumphal Way" extending all the way to the Louvre and in the other direction to the Grande Arche de la Defense. ©2005 Mark and Allegra. Some rights reserved under the Creative Commons License. 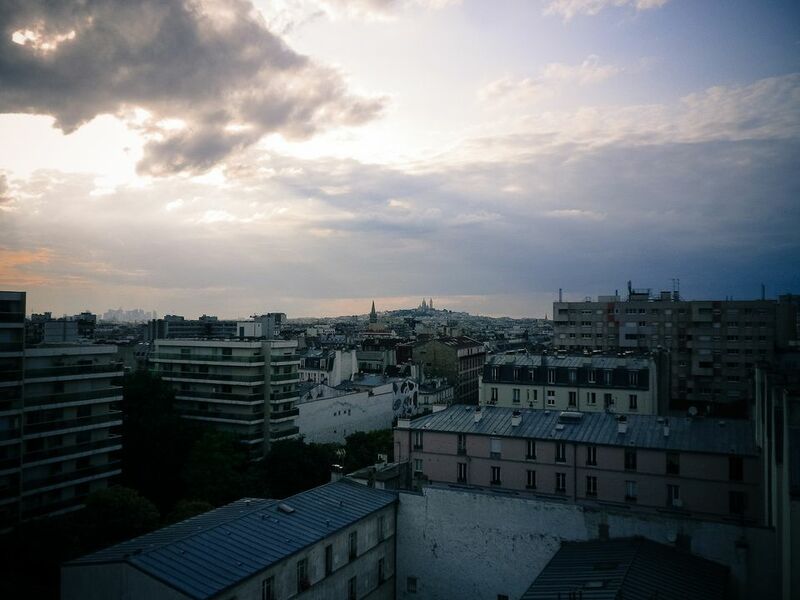 From the rooftop of the Centre Georges Pompidou in Paris' city center, you can procure excellent views of most landmarks, including Notre Dame Cathedral and the Sacre Coeur. You can take the elevator to the top with the purchase of a ticket to the National Museum of Modern Art housed at the center, or opt to dine at the trendy Georges Restaurant located on the last floor for a stunning view. ©2006 Sunfox. Some rights reserved under the Creative Commons License. This little-known jem of a park nestled in a residential, albeit gritty neighborhood of northeastern Paris provides one of the best views of the city, and the romantic-style park winds down the hill for a charming stroll. An excellent off-the-beaten-track afternoon can be had here. Metro: Get off at the Pyrenees stop. To get to the park, take the Rue des Envièrges up the hill from Rue de Belleville until you reach the panorama and the park entrance on your right.